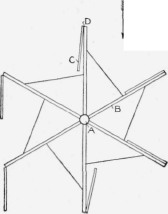 The windmill shown In the sketch is one that will always face the wind, and it never requires adjustment. It consists of a vertical shaft, A, provided with a number of arms, B, on which are hinged square sails, C. These sails are preferably made of wood frames covered with canvas. They are provided with hinges, D, attached to the ends of the arms in such a way that they offer resistance to the wind on one side of the wheel, while they move edgewise against the wind on the other side, as shown. The shaft of the mill can either be run in bearings set on an upright post, the lower end of the shaft turning on a conical bearing, or collars may be used on the bearings to keep it in position. The power can be transmitted with gears or by a flat belt over a pulley. A wheel of this kind is not adapted for high speed, but direct-connected to a pump or other slow-working machinery will prove very efficient. - Contributed by Edward Hanson, Kane, Pennsylvania.